Peter Capaldi and Steven Moffat talk about on the lonely challenge of ‘Heaven Sent’, the next episode of Doctor Who. The Doctor is taking no prisoners: trapped, alone and grieving, he is keen to find those responsible for his pain. That’s the trailer, don’t forget to watch the eighth episode of the new series, The Zygon Inversion, tomorrow evening! Trapped in her own mind and under attack, can Clara turn the tables on her Zygon double? Let’s watch the Clara versus Clara standoff. Kate has it all in hand, but the Doctor and Osgood find out she may not be who she seems. Where is Clara? Steven Moffat and Ingrid Oliver talk about Zygons as they introduce ‘The Zygon Inversion’. Stand and deliver! There’s danger in seventeenth century England and guess who is about to face it! Clara and Ashildr are trapped with some vikings on a spaceship in The Girl Who Died. Clara is lost in space, can the Doctor save her? Let’s find out tomorrow. The Doctor and Davros face each other in this preview of The Witch’s Familiar, the Time Lord threatening his enemy with a useless weapon. The Daleks strive to protect Davros in this preview of The Witch’s Familiar, but the Doctor is escaping. Steven Moffat and Peter Capaldi introducing this episode for you. Also, Steven Moffat teases what’s in store in The Witch’s Familiar. The cover for issue #491 of Doctor Who Magazine has been unveiled, and Peter Capaldi and a whole host of Daleks are this month’s stars: the Doctor is trapped on the planet of the Daleks. You also have 4 new episode preview inside. 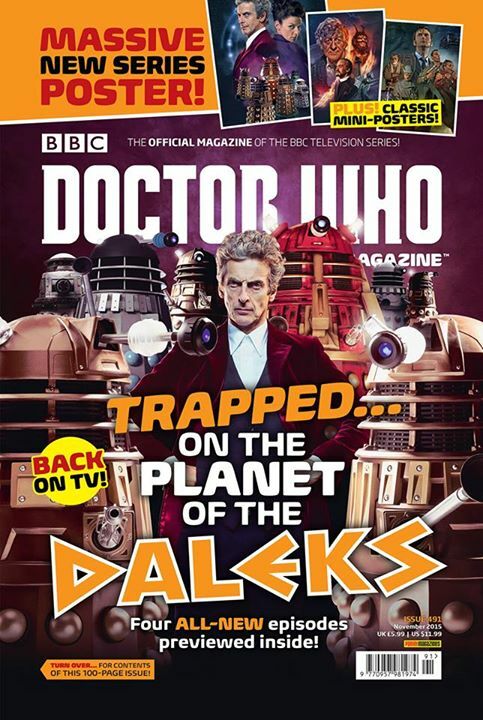 Doctor Who Magazine #491 is on sale from Thursday 17 September 2015, priced £5.99. In the North Pole the Doctor and Clara are joined by Santa Claus’ familiar figure… and his reindeer! 11 more days to Christmas. You can also get a special Sneak Peek at the 2014 Christmas Special, when the Doctor lands in the North Pole on Christmas Day. “This is the North Pole. We don’t want any trouble here.” – Santa Claus. 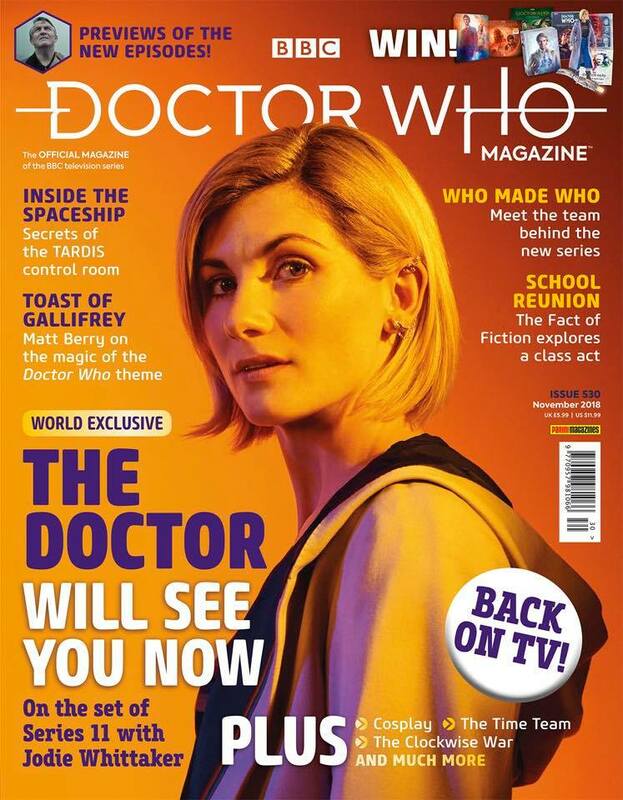 The cover for issue #479 of Doctor Who Magazine has been revealed. 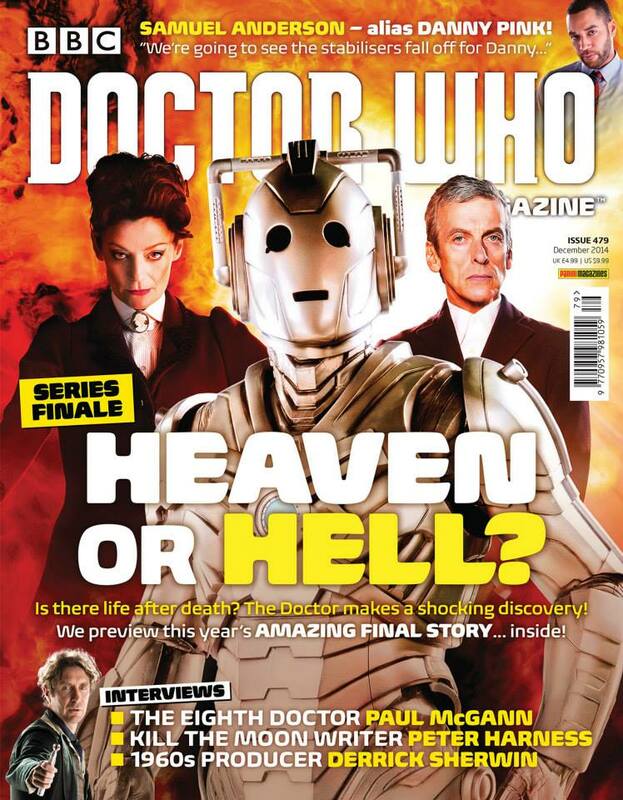 The mag previews the final four episodes of Series 8: is there life after death? The Doctor makes a shocking discovery! You can preview this year’s amazing final story in the pages of this DWM issue. And you can also will see the stabilisers fall off for Danny Pink (Samuel Anderson). You have some interviews with Paul McGann, “Kill the moon” writer Peter Harness and 1960s producer Derrick Sherwin. DWM #479 is on sale Thursday 23 October 2014, priced £4.99. Are you ready? Today is Doctor Who day, with the mission Kill the Moon… Let’s watch a short clip from the seventh episode of Doctor Who Series 8, written by Peter Harness. Peter Capaldi, Jenna Coleman and Steven Moffat introduce Time Heist. A sneak peek: The Doctor & Clara prepare to rob the bank. Who is the terrifying Teller? What if no one is ever really alone?… What if you always have something or someone behind you, watching you? Clara is delighted when she and the Doctor meet Robin Hood, but there’s soon trouble! People say you should never bring a knife to a gunfight, but what about a spoon to a sword duel? The Doctor faces off against Robin Hood’s sword with nothing but an ordinary piece of cutlery even if he can’t believe exists. Have you met Danny Pink yet? In the second episode of the series 8, Into the Dalek, Clara is introduced to Danny Pink, changing his life forever. So this is a preview. A kind of. It’s not the first time the Doctor is dealing with malfunctioning Daleks… Rose Tyler help another one healing some years ago. This time the Doctor introduces Clara to ‘Gun Girl’ and her uncle, but a shock is waiting… The Dalek is malfunctioning so bad he is turning good. Morality as a malfunction make him ask the question Doctor… will you help me? BBC News featured the Series 8 launch, clips from the second episode were shown and Peter Capaldi interview. BBC have released the second preview clip for the Time of the Doctor. The Time Lord and Clara are both in trouble in this scene from the 2013 Christmas Special.